If you’re starting a new business, then getting organized should be one of the first things you get in order. There is so much to think about and take into consideration that it’s important to have a dedicated space to work on your endeavor. Depending on the shape and size of the place, it might not be necessary to buy anything new. 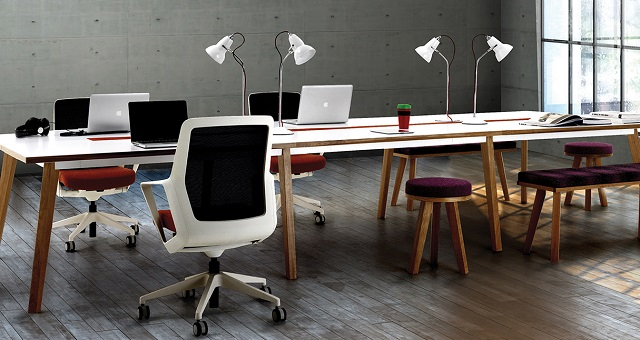 You may find that the best place to buy office furniture is actually within your home itself! Rethink function: a bookcase can be more than a bookcase. It also is a mailing station, filing cabinet or laptop stand. Repurpose wooden crates by stacking them on top of each other, or screwing them to the wall as shelves. These can create additional storage for bulky items like yarn or fabric. With a fresh coat of paint, the old dining table would make a great solution for a desk. Find an unused corner to create a home office to serve as a home base for your new company. Even the smallest of spaces can work in a pinch. If you happen to have an empty closet it, make it yours. Paint it a happy color, mount shelves, and lighting into it, and presto! Instant office. Do you have space under the stairs? If you want to go the Harry Potter route, set up your desk and a laptop underneath the staircase. An old armoire can be given new life by being transformed into a mini office space. Customize the shelves and make it work for your files and equipment. It doesn’t have to be gigantic, but a place to call your office serves as a point of pride and gives a sense of ownership to your new company. Adopt a space in your home you can call yours.